It's a case of 'which witch is which' on Gotham this week with Trespassers, an episode that probably I would mark down as a bit lackluster if not for some of the performances. The main story involves Captain Jim Gordon (Ben McKenzie) rescuing child slaves in the Temple of Doom-like area controlled by the gang called The Soothsayers, as intimidating a gang name as can be found. As a side note, The Soothsayers sounds like an awesome band name. To pull off his Mad Max Beyond Thunderdome routine, he needs the vehicles held by his former fiancee, Barbara Kean (Erin Richards), still bitter about losing her BFF Tabitha and angry at Jim for letting Tabitha's killer Penguin escape. She somewhat reluctantly agrees to let him have the vehicles, but she'll need something in exchange: taking Pengy down. Whether he agrees or not is a bit unclear to me. Gordon and his Man Friday Detective Harvey Bullock (Donal Logue) do find the kids, but wouldn't you know it, the Soothsayers and their leader, Sykes (Alex Morf) won't let them go easily. Moreover, a couple of kids are stranded, and Gordon, Bullock and Gabriel (Will Meyers), about the only teen slave, must essentially fight their way to the safety of their "Green Zone". That entails a side trip to a spooky house occupied by a Miss Havisham-type and her creepy child ward. Eventually, with low ammunition, Sykes has a Mexican standoff with another gang for Gordon, who has a bounty on him from Pengy. Bonkers Babs shows up to save them all but still needing her help repaid. We then get two subplots. 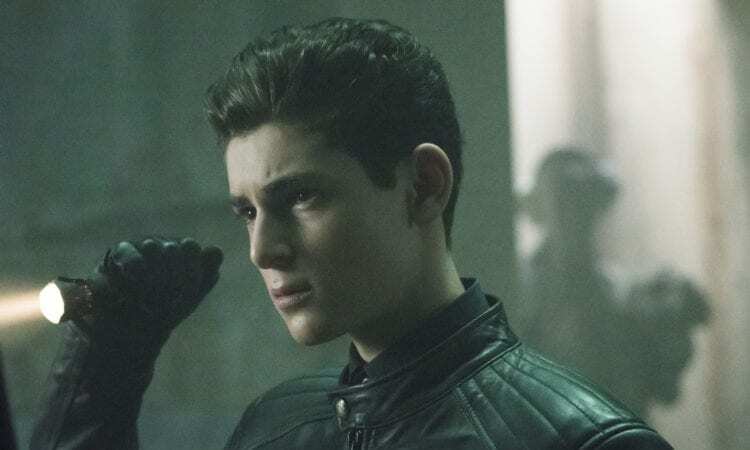 The larger of the subplots involves Bruce Wayne (David Mazouz) searching out 'The Witch' who could help his friend Selina Kyle (Camren Bicondova). That witch turns out to be Ivy (Peyton List), Selina's frenemy who still harbors bitterness against her. Her power over plants has killed many men in this chaotic city, and she begs Bruce for help. Naturally, she is still duplicitous towards her captors, but in exchange for being left alone in her wicked garden she gives Bruce a seed that she says will cure Selina. He gives it to Selina, who after a fearful start does appear to recover, only unbeknownst to him this has affected her in some way, giving her cat-like eyes. The second and much smaller plot revolves around Edward Nygma (Cory Michael Smith) and his continuing struggle to stop sleepwalking. He thinks he's starting to recover when he happens to find a Tank in the Tub, a biker named Tank (David Kallaway) whom Edward kidnapped. Ed has no idea how that all went down, but things don't improve when Ed and Tank discover the rest of the biker gang has been killed, perhaps at Penguin's orders. Somehow, Trespassers seemed to be a pastiche of other stories, with the main story a bit dull. I think it is because by now, I've grown immune to caring about the 'little children in need of rescuing' trope, made worse by the fact that even before the big shootout I knew there'd be one or two children 'accidentally' left behind. Granted, I was not expecting the 'haunted house' aspect, but this Escape From Gotham City act I figured had to have some kind of complication pop up. It could not be a simple smash-and-grab for the children, could it. I also wonder if it had to be children. Would Gordon be willing to not rescue slaves if they were adults? My thinking is he wouldn't, but I cannot shake the idea that children were used to try and create more sympathy for their plight, even if I would think the Soothsayers would find children to make poor slaves no matter how often they watched the Indiana Jones film. It also does not help that the wheels keep spinning for Ed to do something but not actually moving far if any. I can see that this is building for something, but exactly for what I don't know. The last-minute rescue by Bonkers Babs seems to be far too convenient even for Gotham. In short, there was a lot I was not buying. What I did like in Trespassers were some of the performances, in particular Mazouz as Bruce Wayne. He has a steadiness to his characterization, where he can mask fear one moment and show caring vulnerability another. It depends on whom he is acting with. List's Ivy is very camp, though I figure that's how Poison Ivy is meant to be so I'm not going negative on her. With List, Mazouz is able to show strength with a touch of fear for his life. Bicondova and Mazouz have always worked well together in this danse macabre between the future Batman and Catwoman, and Mazouz displays his youthful concern. It's nice to see Logue bring back some of Bullock's old sarcasm and dry wit, as when he remarks how he has to go explore the basement in the obviously creepy house by himself. Even his horror at seeing an Ed Gein-type basement with the added crematorium has a mix of fear and mirth, an obviously frightened Bullock still having some bit of humor. It's too soon to know if Meyers will return as Gabriel, but I wouldn't mind seeing this teen slave return, and I do hope Benjamin Snyder as the creepy orphan pops back up too. On the whole, Trespassers was not terrible only because it had strong performances from Mazouz, Bicondova and Logue. However, I found most of it to be a bit slow, predictable and a bit off. Then again, it is another rebuilding episode, so perhaps I shouldn't be too harsh with it.